"My mother-in-law makes this for Thanksgiving every year. Our family can't get enough of it. You can use frozen cauliflower instead of fresh, but it is not quite as good." Heat one inch of water to a boil in a saucepan over medium-high heat. Add cauliflower florets, and cook covered for 7 to 9 minutes, or until tender. Drain and set aside. Melt the butter in a large skillet over medium heat. Saute mushrooms, onion, and almonds. Stir in the chicken bouillon. Dissolve the cornstarch in water, and gradually stir into the mushroom mixture. Cook until thickened. 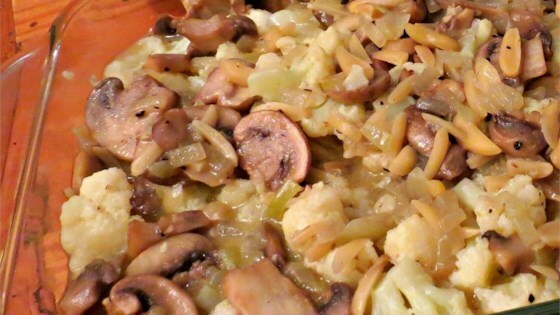 Pour the mushroom mixture over the hot cauliflower, and serve. Sorry I didn't care for this recipe, it had no flavor. I would have rather just steamed the vegies. Thanks anyways! I didn't have mushrooms, so left them out. I used half the bouillon and much less butter. It turned out just great. I'll try it with the mushrooms next time.